I have been working extensively on creating a space for my client that reflects his global and masculine tastes while still working in some chic modern and mid century pieces. Here are 2 different schemes for my client's dining room with the 2 different choices for lighting. In this first room I have these AMAZING copper hole punched pendant lights which I would hang 3 down the center of the tray ceiling. They are quite stunning and have that feeling of something unique and one of a kind which I love! At 16" around, they are definitely going to make a statement especially when paired with the imported teak dining table that's trestled on top of the most amazing chrome support legs. This room is a good example of having something very rustic and raw and mixing it with modern chairs and these industrial wine racks. The lightness of the art, the chairs and the curtains make this room work especially when mixed with the dark pendant lights and the wine racks. It's a good blend of light vs dark and rustic vs polished. In this second option I am simply changing the lighting fixture to a linear fixture that has 5 clear glass pendants that you can stagger in height. 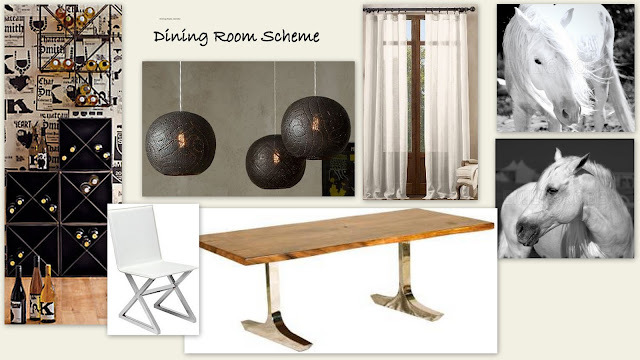 I would hang 2 of them as shown so that they cascade down the center of the table providing ample light. When put on a dimmer I could see the magic of such a simple lighting option which reminds me of how simple white candle light twinkles and the affect that has on the mood of a room and then of coarse the memories made in that room. This option also works because it is neutral and takes up little visual space. It is the more modern option of the two. So that's where I'm at on the dining room. Two seemingly perfect spaces, but with differing options for lighting. What do you think?! Be my pretend client for the day and share your thoughts on the lighting options for this global dining room. I really like option A but, I kinda feel option B is the better choice. Option A just seems to be more dark especially over that pretty table but, Option B really looks very bright seems like B would make a space look bigger. Love them both, but I'm more in love with the artwork. Where are both pieces from?? Lighting is a very important aspect of a room as it can set the mood, either by the design of the fixtures or the amount of light it provides. Option A does look great, but I’m worried about how much light it could provide through its design. 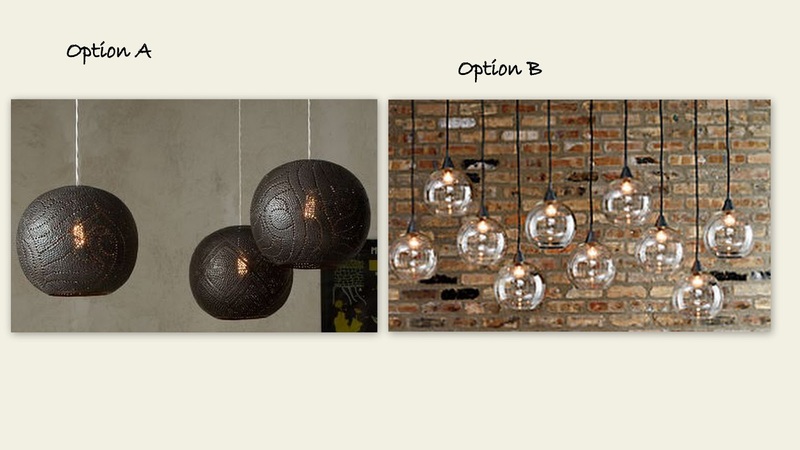 That in mind, I would pick B, mostly for the option of incorporating it with a dimmer. Hi Cody, thanks for the imput. I received overwhelming Option B replies which is where I leaned to as well. Can't wait to reveal it for you. I LOVE that table-- can you share the source? Hi Kathleen, sorry for the late reply. The table is sourced through my personal furniture lines the I am signed with as a designer. If you know the dimension of the space I would be happy to quote a size for you (we offer several sizes). 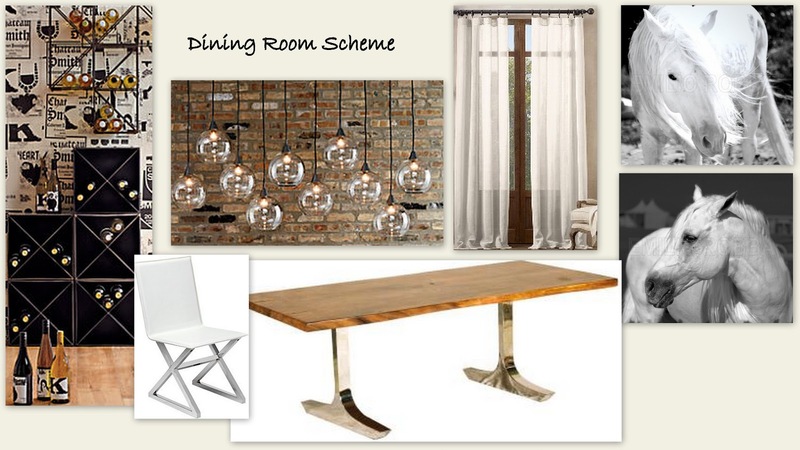 I also offer mood boards for room design at a fair price. I would be happy to send you more images if you are interested. It is a stunning table and is a fraction of the designer pricing you will find at Hudson for a similar look. And it is real wood with the chrome base I really need to show better images of it. Project Sneak Peek, The Man Room Baby!